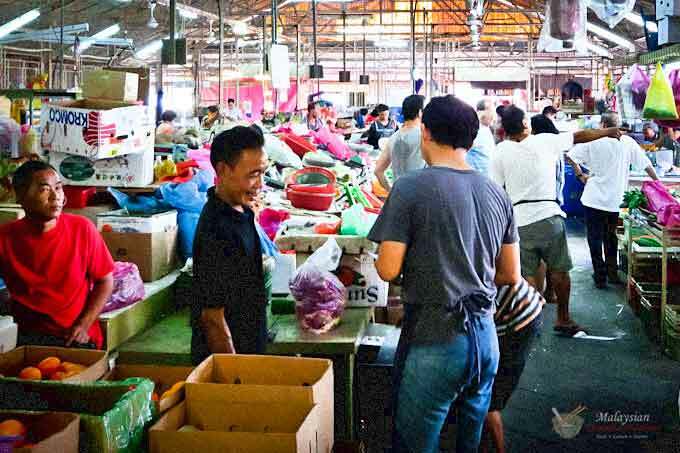 Market Day is a recollection of the sight and sounds of an old wet market of my childhood. Back then the wet market was central to life in the community. “Honey, can you pick up some lunch meats on your way home?” my wife chirped over the phone. I pulled into the parking lot of our local supermarket, step over to the gourmet meat counter and scanned for the signs saying “Black Forest Ham” and “Buffalo Spice Chicken”. Half a pound each, and another half-pound of Pepper Jack cheese. A couple of bags of potato chips and I am ready to check out at the self-checkout counter. I swipe my credit card at the machine and I am off again. I bought groceries, but it is not the same as going to the market. That was a whole different thing more than 40 years ago. For Mom and Dad, market day can only be early morning forays. That was the time when local markets ran. 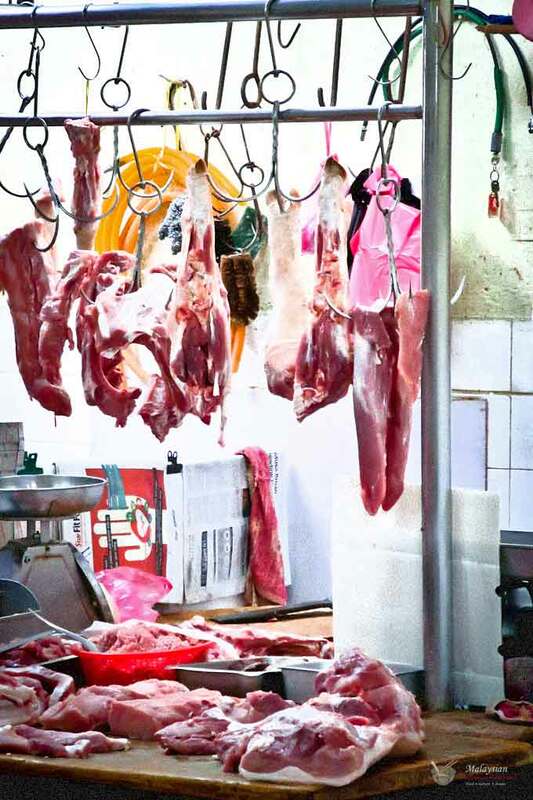 In the pre-refrigeration days, meat and produce will spoil rapidly in the tropical midday sun. The cool of the morning was ideal for the wet market. Mom always wore her hair in a bun and dressed up in a sarong kebaya even if the wet market would seem like the last place for it. 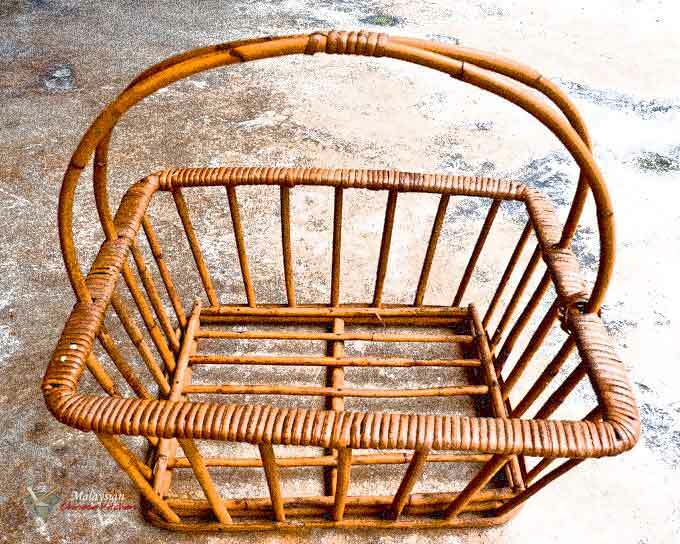 She held a rattan basket in the crook of her elbow and slipped on a pair wooden clogs. The latter is a concession to practicality that nyonya ladies of yore wore to wade through the often wet market floor. In a previous article called Kopitiam Days, I had mentioned how I would stick with my Dad when Mom went to the market. Occasionally, I would end up with Mom. This was not her preference as she had her hands full with stuff and holding on to a wriggly kid was the last thing she wanted. I preferred the “dry” part of the market where they sold fruits, tofu, snacks, and some toys. I was always afraid of the meat and fish section and could not understand why Mom spent so much time there. The fresh smell of blood made me queasy. The fruit stalls had an abundance of local fruits like bananas, pineapples, rambutans, and mangoes to name a few. 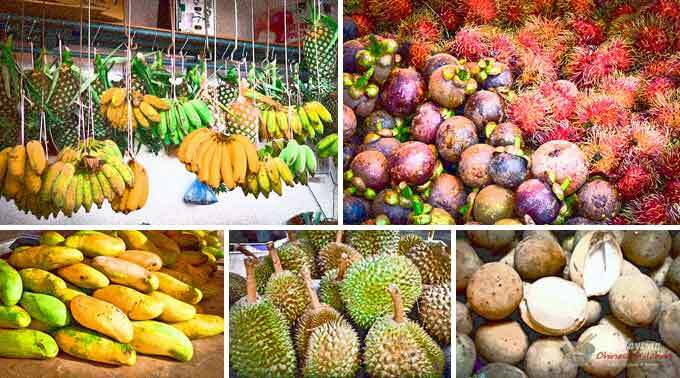 Durians, mangosteens, and langsat were highly seasonal. They would appear in great profusion for a period of time and disappear for the rest of the year. Imported fruits consisted mainly of apples, pears, and oranges. Berries were virtually unheard of. People carried their groceries in baskets or packages strung in raffia twine. There were no plastic bags. Everything was either wrapped in newspaper or just placed into the rattan basket. There were no shopping carts. Mom would have to get Dad to come along to carry heavy fruits like watermelon and jackfruit. 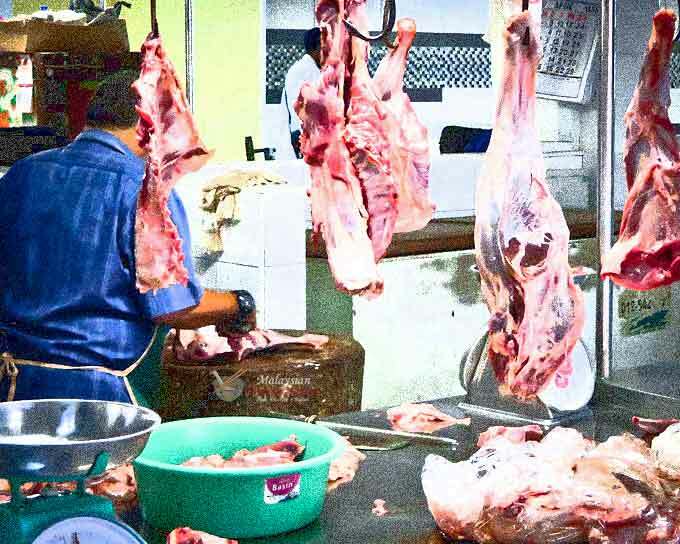 The meat area had a small halal section where Indian Muslim vendors sold mutton and beef. Back then, the Muslims did not mind having their meat stalls next to pork stalls. 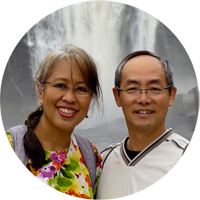 Everyone bought life poultry from the Chinese poultry farmers to slaughter at home. The wings and feet of life chicken and ducks were tied together so that they could be transported. I cannot imagine anyone doing this today, even in Malaysia. The novel idea of pre-slaughtered chickens and ducks only appeared at the wet markets when I was in high school. The other place that Mom would spent a lot of time at was the vegetable section. 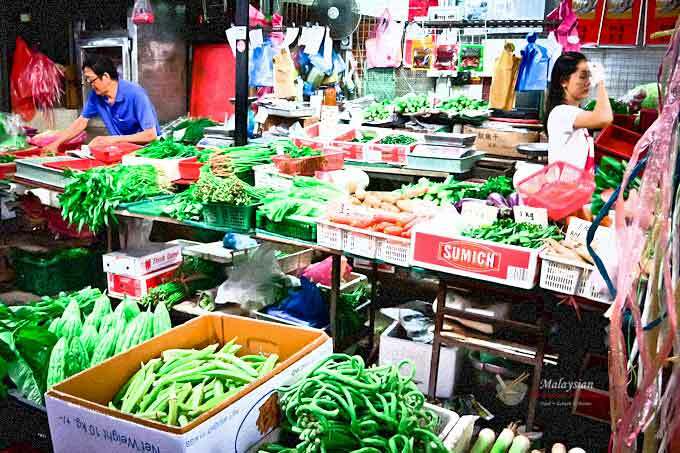 Malaysian markets overflowed with green veggies from cabbages to kangkung. 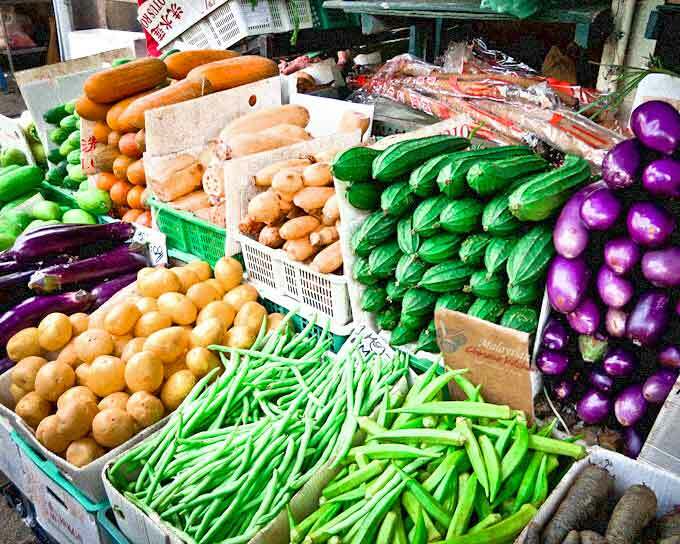 To my young eyes, Mom took too long to buy different vegetables, none of which I wanted to eat. Now, I miss the profusion of greens, with much fewer choices at the local grocery stores here in North America. Besides vegetables, Mom also made stops at the tofu and noodle stalls. There was a great variety of freshly molded white and yellow tofu, fresh and dried tofu sheets, tofu sticks, and every other soy product to fill the Malaysian Chinese kitchen. The same was true of freshly made and dried noodles. There were piles of yellow egg noodles, pulled noodles, rice pin noodles, laksa noodles, and koay teow. Also packets and boxes of beehoon, glass vermicelli, and mee suah. So many varieties in one single place. Mom also made a point to stop at the fish monger to pick up freshly caught salt-water and river fish. Our town was situated near a river estuary as well as the coast. In those days, the fish were all locally caught, with little to no freezing involved. It was all very fresh and relatively cheap. My favorites were salt-water boiled chubb mackerel (sek hu in Hokkien) and conger eel. The latter was cut into sections and deep-fried. 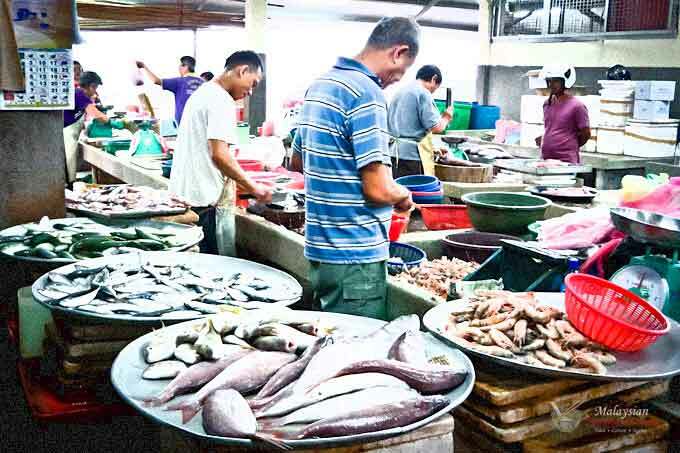 The most priced fish were the silver pomfret (tao tay) and red snapper (ang cho). Prawns and shrimp were plentiful too. It was quite the place for having seafood. 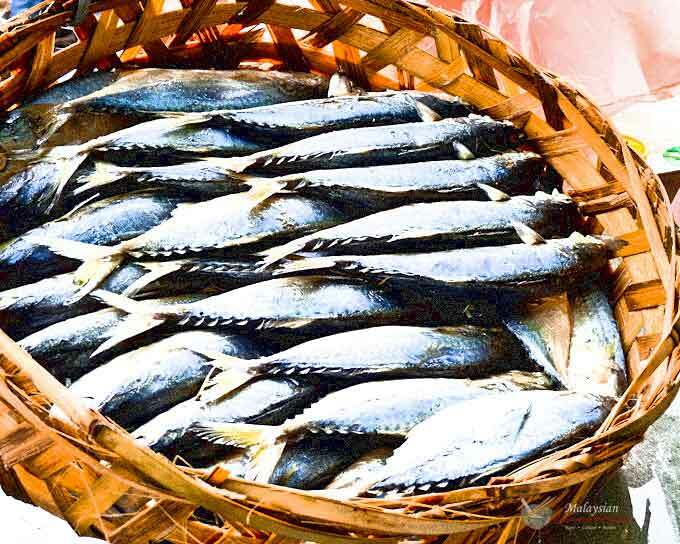 The cheapest fish one could buy were chubb mackerels (kembong) and salted fish, considered as “poor man’s rations”. 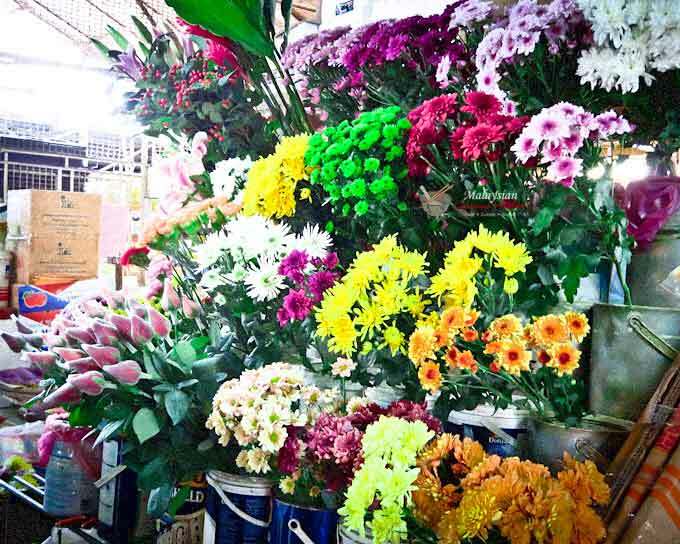 One of the last stops Mom would make before heading out of market would be the flower stall. The nyonyas bought mainly chrysanthemums as offerings for pai sin (prayers) at the home altars. Since these stalls were close to the ones selling snacks and toys, this was my last chance to make a puppy-eyed appeal for a souvenir from the outing. Sometimes Mom would relent and buy me a toy filled with candy which made my day. I remember having a little ship-shaped whistle that I treasured so much. That old market is gone. It was moved to another location right about the time I left for college. Mom had complained that she had a hard time locating her familiar stalls at the new market. I visited about 5 years ago and now a strip mall sits on the old market site with a motorbike shop as one of its main tenants. I’m pretty sure most families living there today do their grocery shopping in big, well-lit supermarkets just like I do here in America.